I always said that I would never have a gender reveal party. Just go ahead and call me a liar … apparently being pregnant for yourself changes a lot of things you thought you’d never do. I’m sure I’ll lie again and do something else I said I wouldn’t, and I’m okay with that.The ultrasound tech assured me that it’s much more fun to find out the gender with people who love you and care than it is in a room with a stranger, and that solidified my feelings on the reveal party. On Sunday, September 25th, Jimmy and I threw a gender reveal party at our home, and invited our family and close friends to be a part of the surprise. We had our ultrasound that Monday and had been waiting in suspense ever since … that was the longest week ever! But it was completely worth the wait, and I am so excited to share the details from our party (and the reveal!) with you. I’m going to go ahead and apologize for the picture overload, but I just can NOT hold back. Everything was so perfect: the decor, the food, the cake, the guests, AND the outcome. I crafted for two weeks leading up to the party, and Jimmy and I prepared all week cleaning, decorating, rearranging furniture, hanging new light fixtures, and getting everything ready for the big day. 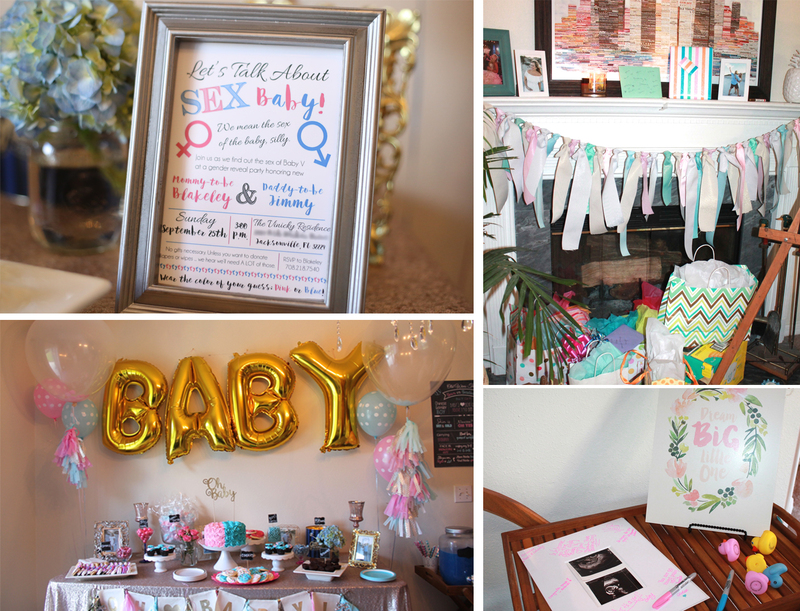 This was to be Baby V’s first party, after all – We had to make it special for him or her! We had our guests wear the color of their guess, pink or blue, and I was surprised at how many wore blue! My guess was a boy, too, but I wore white to be neutral. Jimmy wore a pink shirt and navy blue shorts to play fair, but he had a feeling it was going to be a girl (he said mainly because he has no clue what to do with a little girl!). Excuse the dots and marks all over the chalk board – my three-year-old niece got a hold it. I loved how our dog Lexie came running up just as we were about to start the countdown. She wanted to be a part of the reveal! Ready??? Here we go …..!!! Jimmy kicked off the week by having beautiful pink and blue lilies delivered to me at work with the best note ever. He’ll probably kill me for sharing it, but it said, “Doesn’t matter pink or blue, I’m just glad to be having a baby with you. I know this is cheesy, I gagged too. Just think of it as practice for when you smell baby poo!” HAHA how hilarious is that?! I teared up the second I opened the box of flowers and had to have my boss read it to me (get a hold of yourself, hormones), and we were both crying laughing after reading it. So cute! I made pretty much everything as far as decor, including the invitations, banners, bow and mustache stickers on the cups, photo props, signs, balloons tassels, cake topper, and confetti for the clear balloons, and my fabulous mom showed up with the beautiful wreath she made for the front door. I absolutely loved how everything came together. The dessert table was my favorite, of course, but the drink and food table turned out so cute, too! I am so thankful for my mom and friends who came early to help me decorate and set up, even though I swore I didn’t need it and had it all under control. I guess I was wrong, so thank you for finishing up so I could get myself ready! My poor friend Meghan was the luck (or unlucky?) one who we handed off the ultrasound result to, so she basically had to lock herself away for a week so she didn’t spill the beans. Thanks for handling all that pressure so well, Meghan, and for ordering the cake and confetti sticks! When it was time for the big reveal, we had all of our guests stand around us in a semi-circle. On the count of five, everyone flicked their sticks toward us and a flood of PINK confetti came flying out!!! AAAAHHHH PINK!!!!!! I can’t even begin to explain the excitement than ran through me in that moment. For nearly 20 weeks of pregnancy I thought I had a little boy in my tummy and was so prepared to see blue. I don’t know if it’s because the Chinese gender calendar said it was a boy (and pretty much everyone swears that thing is always right), because of the way I was carrying, or because I wanted a girl so badly that I was psyching myself for the complete opposite, just in case, but when I saw that pink I about fell over. I screamed, I laughed, I cried, I jumped up and down …. it was the most exciting feeling I have ever experienced. I’m crying writing this right now – geesh! I do want a boy, but I really really really wanted to have a girl, and we only want two kids. I mean, come on, I HAVE to have a girl. I can’t play dress-up and curl hair and have slumber party makeovers and stock up on sequins, bows and tutus with a boy! I also absolutely love the relationship I have with my mom – she is my best friend, and I have so many memories of all the fun girly things she did with me and my sister growing up – and I want to have that same relationship with my little girl. I also love the relationship I have with my dad – he’s my superhero and I am such a daddy’s girl – and I can’t wait for Jimmy to experience that. Next up … registering and decorating the nursery! I can’t wait :). P.s. My advice for future gender reveal party planners: A. Have a photographer there to capture every minute. (Thank you Ashley for coming to the rescue! Your pictures are beautiful and I am so happy to be able to relive these moments forever.) B. Have someone video the reveal, or at least set up a camera on a tripod. Our video is coming soon – I can’t wait to share it with you! C. Don’t wear heels during the reveal. I almost broke my ankle from all the jumping up and down! And pretty sure I almost knocked Jimmy over at least three times from falling on him and him having to hold me up.